Find new keywords with our great feature. Since Kompyte tracks millions of keywords on Google every day, Kompyte knows which keywords millions of companies perform on SEO for or run ads for. 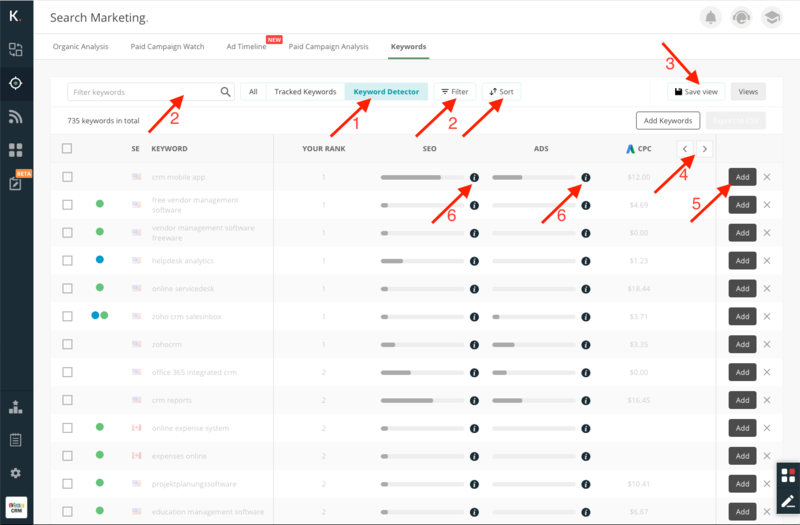 With this huge amount of data we have created the Keyword Detector, a tool to discover which other keywords your competitors are using for their SEO and ads campaigns. 1: Select Keyword Detector to see suggested keywords. 2: Search, sort and filter by any column to narrow your search. 3: Want to keep a specific search? save your search as a View and access it anytime. 6: Move your mouse over each column to see how many competitors use each keyword on their SEO and ads campaigns. Seen a keyword you want to track? Click 'Add' (5) and Kompyte will start tracking it right away.